Rauter S, Coh M, Vodicar J, et al. Analysis of reactive agility and change-of-direction speed between soccer players and physical education students. Human Movement. 2018;19(2):68-74. doi:10.5114/hm.2018.74061. Rauter, Samo, Milan Coh, Janez Vodicar, Milan Zvan, Josef Krizaj, Jozef Simenko, and Lukasz Szmajda et al. 2018. "Analysis of reactive agility and change-of-direction speed between soccer players and physical education students". Human Movement 19 (2): 68-74. doi:10.5114/hm.2018.74061. Rauter, Samo et al. "Analysis of reactive agility and change-of-direction speed between soccer players and physical education students." Human Movement, vol. 19, no. 2, 2018, pp. 68-74. doi:10.5114/hm.2018.74061. Rauter S, Coh M, Vodicar J, Zvan M, Krizaj J, Simenko J et al. Analysis of reactive agility and change-of-direction speed between soccer players and physical education students. Human Movement. 2018;19(2):68-74. doi:10.5114/hm.2018.74061. 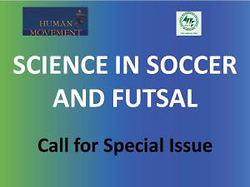 The main goal of the experiment was to examine the differences between reactive agility (RA) as non-planned (randomly selected stimuli) movement and change-of-direction speed (CODS) as pre-planned movement among different levels of sports performance - young soccer players and physical education students. The two groups in the study included 36 young male and female soccer players and 58 male and female physical education students. Timing for universal agility was defined by two different specification: pre-planned agility as a change of direction speed and non-planned (randomly selected stimuli) agility as reactive agility. The study used FitLight Trainer, a wireless system of interconnected light powered sensors. Soccer players were significantly faster in selected test of CODS (-1.73s; 13.1%) and RA (-2.34s; 14.3%). The greatest difference between male and female subjects was observed in the non-planned universal reactive agility UA-RA (-2.84s; 17.9%). A t-test indicated statistically significant gender differences in the selected test of pre-planned (non-reactive) and non-planned (reactive) agility among soccer players and students. The practical message for coaches and related professionals is that agility in team sports (including soccer) as motor skills represent various physical qualities. Therefore, it should be diagnosed and developed via separate assessments and training.